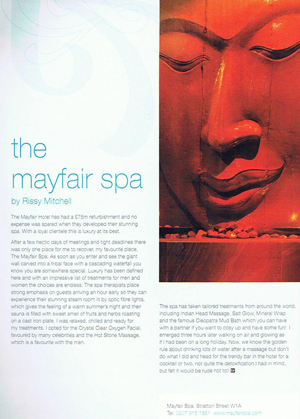 The Mayfair Hotel has had a £75m refurbishment and no expense was spared when they developed their stunning spa. With a loyal clientele this is luxury at its best. After a few hectic days of meetings and tight deadlines there was only one place for me to recover, my favourite place. The Mayfar Spa. As soon as you enter and see the giant wall carved into a tribal face with a cascading waterfall you know you are somewhere special. Luxury has been defined here and with an impressive list of treatments for men and women the choices are endless. Tne spa therapists place strong emphasis on guests arriving an hour early so they can experience their stunning steam room lit by optic fibre lights, which gives the feeling of a warm summer’s night and their sauna is filled with the sweet smell of fruits and herbs roasting on a cast iron plate. I was relaxed, chilled and ready for my treatments. I opted for the Crystal Clear Oxygen Facial, favoured by many celebrities and the Hot Stone Massage, which is a favourite with the men. The spa has taken tailored treatments from around the world, including Indian Head Massage. Salt Glow. Mineral Wrap and the famous Cleopatra Mud Bath which you can have with a partner if you want to cosy up and have some fun! I emerged three hours later walking on air and glowing as if I had been on a long holiday. Now. we know the golden rule about drinking lots of water after a massage but don’t do what I did and head for the trendy bar in the hotel for a cocktail or two. Not quite the detoxication I had in mind, but it felt it would be rude not to.